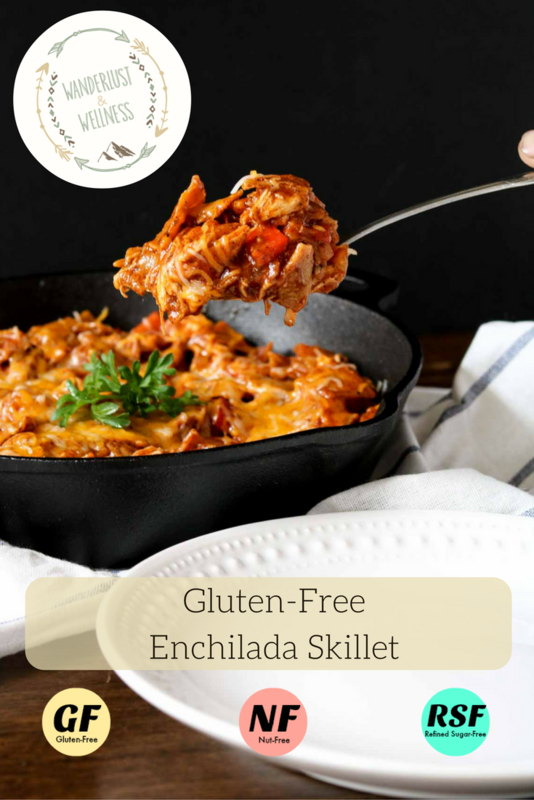 Enchiladas are my favorite but they’re so time consuming to make, so why not throw together this gluten-free chicken enchilada skillet in half the time! The corn tortillas in enchiladas are naturally gluten-free so there’s no overthinking here. While corn isn’t normally a Paleo food, I still occasionally eat corn tortillas. 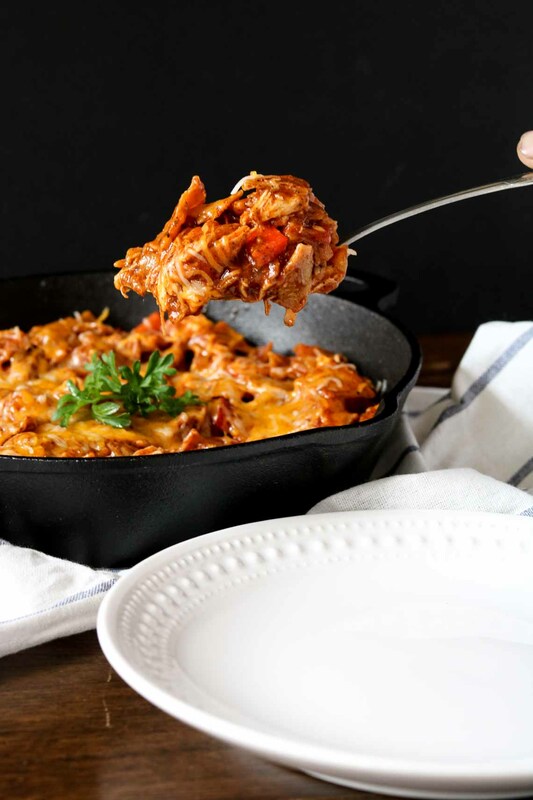 This gluten-free chicken enchilada skillet is also oozing with cheese, which is my favorite part! You guys will also LOVE the homemade enchilada sauce. It is hands down better than any jar sauce I’ve tried. Reduce heat down to medium and add in the tomato sauce, water and spices. Stir well, bringing to a simmer and then reduce heat down to low. Keep sauce on low, stirring occasionally, while you start the skillet ingredients. In a large skillet, heat 2 tsp. olive oil over medium heat. 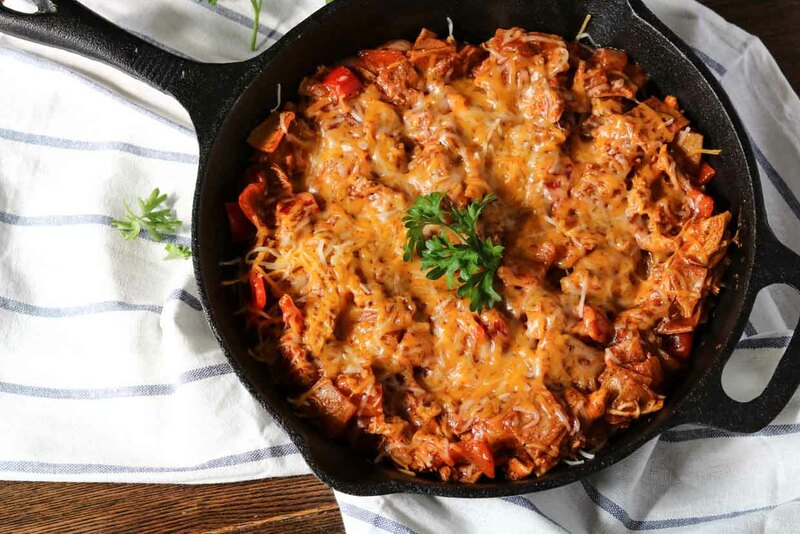 Cut the corn tortillas into small square pieces and add to the skillet. Add salt and pepper, cook for 5-10 minutes, or until the pieces begin to crisp. 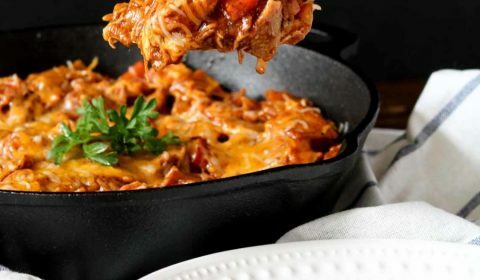 Remove the tortillas from the pan. Remove skin from the rotisserie chicken and pull off the breast and thigh meat. Add additional teaspoon of olive oil to the pan and add in the chicken, chopped onions, bell pepper, garlic, and remaining seasonings. Sauté for about 10 minutes or until the vegetables are soft. Add the corn tortillas back into the skillet and stir. Add in 1 cup of the shredded cheese and stir until melted. Add in enchilada sauce and stir until well combined. Top with remaining shredded cheese and serve.